This is the book I wished had been available when I got sick. Through luck and perseverance I was eventually able to find simple ways to restore my health, some of which my doctors said would never work. Some of these methods specifically remedied the underlying causes of my arthritis, and some are applicable to anyone who wishes to feel better, no matter their current state of health. My personal miracle is that I found ways to get well. This book will show you, step by step, how you can get better, too. People with an autoimmune type of arthritis. Autoimmune arthritis may be caused by rheumatoid arthritis, juvenile rheumatoid arthritis, reactive arthritis, Reiter's syndrome, inflammatory bowel disease arthritis, systemic lupus erythematosus, ankylosing spondalytis, psoriatic arthritis, chronic fatigue syndrome and fibromyalgia. Doctors are just starting to recognize that a sizable number of these cases are caused by food-related problems. This brings us to our second group of readers. People with food allergies, food sensitivities or food intolerances. More than 70 medical conditions have been linked to food-related problems. These conditions include arthritis, myalgia, fatigue, edema, hypoglycemia, diabetes, being overweight or underweight, premenstrual syndrome, sleep disorders, candiditis, depression, and respiratory conditions such as hay fever, asthma, bronchitis, recurring ear infections, sinus conditions, rhinitis, laryngitis, allergic sore throat and hoarseness. Other conditions include digestive problems such as gastroenteritis, irritable bowel syndrome, celiac disease, inflammatory bowel disease, diarrhea, constipation, colic and malabsorption; cerebral conditions such as headaches, dizziness, learning disorders and irritability; and skin-related conditions such as dermatitis, eczema, hives and rashes. By identifying and treating or eliminating food allergies, food sensitivities and food intolerances, many seemingly hopeless chronic health problems can be improved or eliminated. Friends and family who provide major physical and emotional support to someone with arthritis, food allergies, food sensitivities, or food intolerances. Since these conditions can make a person too sick and tired to do a good job of finding out about options for healing, such caregivers often make all the difference in whether someone gets well or remains sick. Armed with the knowledge in this book, caregivers can help loved ones learn about how to get well, and help them implement these proven strategies. Healing professionals who work with people with autoimmune arthritis and food-related problems. Much unnecessary suffering still goes on because the knowledge in this book has not yet fully reached all levels and branches of the healing professions. This book can serve as "continuing education" on the latest and most effective complementary therapies that are now available. Because it is written in lay language, it may also serve as a valuable resource for their clients. References to the scientific literature are also included. HMO administrators interested in lower treatment costs. Autoimmune arthritis and food-related problems can lead to a lifetime of frequent doctor's visits, medical tests and interventions, and expensive medications. These patients don't go away, they just get sicker, angrier, more desperate, and more aggressive in demanding medical care. Many of the interventions described in this book are inexpensive. Many are steps that patients can take at home, without running up medical bills. Providing this book as a resource for patients with autoimmune arthritis, and food allergies, food sensitivities, and food intolerances could greatly increase cure rates and significantly lower treatment costs. Provides hard-earned, practical, detailed information that is critical for successful healing of arthritis, but that is not found in any other book. Without this information many people with arthritis will not get well. Presents this information in a clear, simple fashion. Organizes this information into a well-researched, easy to follow plan for getting well again. Explains how to carry out simple adjustments to restore health, some of which my doctors said would never work. I spent hundreds of hours in medical school libraries finding well-done studies that clearly demonstrate the effectiveness of these methods, even though my doctors scoffed at them. I have included more than 130 references, so you don't have to take my word for it. Can shave years off your attempts to find a way to get well again. 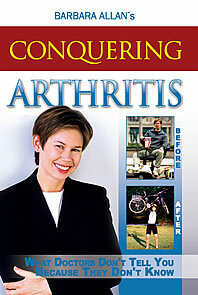 Is based on the experience of people with dramatic and lasting recoveries from arthritis. Is not based on overselling a single magic bullet as a cure. Focuses not just on coping with arthritis, but on curing it. Screens out silly or potentially dangerous "cures". May just be the answer to your prayers. Some specifically remedy the underlying causes of arthritis. Others, which are equally powerful for healing arthritis, are more general health builders applicable to anyone who wishes to feel better. Clear descriptions of why the strategies work. Clear descriptions of the scientific studies that prove their effectiveness. A glossary, so that even if you don't have a science background, you can still understand what it all means. A way to bypass the current allopathic medical model, where patients with autoimmune disorders are unlikely to get well. Those in the medical field are aware that, short of joint replacement, very few patients treated by rheumatologists can expect any lasting or substantial improvements. A new plan, one that cures by correcting the underlying problems, not just covers up symptoms or relies on drugs that perpetuate the problem. Of the many alternative treatments touted for healing arthritis, which treatments actually have a good track record? Which have been tested scientifically? How can all the various proven treatments be combined into a comprehensive, easy to understand, step by step plan? Is there such a thing as an arthritis diet? Why is it necessary to identify food sensitivities to recover from arthritis? How can I use fasting to test for food sensitivities? Why would I want to? What are the benefits of a fast and how can I retain them once it is over? What are hidden allergens and why is it important that I avoid them? Where are they found? Once I know what my food sensitivities are, how can I find safe food? How can I get safe food at restaurants? When traveling? How can I get rid of food sensitivities? What foods help heal arthritis? How? What vitamins and supplements help heal arthritis? How? Why is exercise important? How can I possibly exercise when I am this sick? What does meditation have to offer in terms of pain management and relief? Is there a simple way to get started? What are trigger points and why is knowing about them important for making a complete recovery from arthritis? All of the nine secrets in this book work together synergistically. Because of the synergy, you can benefit from implementing many of the strategies in any order. However, experience and common sense dictate that implementing the strategies in the order of the chapters is most likely to bring about the quickest results.